This event will be preceded by a Conversations | Collaborations program The Encounter, part of a series curated by Charlie Cannon at Brown University. 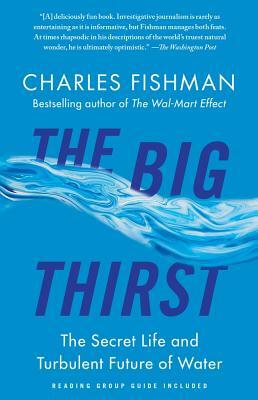 Join us for a OneBook book club to discuss The Big Thirst by Charles Fishman with people from a wide spectrum of Providence area arts and community organizations and affiliations - artists and non-artists, students, academics, activists, and public sector representatives who are commonly concerned/passionate about the future of water. In addition to the issues raised in this book and their relationship to the Providence community, we will also examine the artist's role as public intellectual in displaying, provoking, engaging environmental degradation (and individual, community responsibility) themes, specifically surrounding water. This discussion will be a great opportunity to make new connections, cross-pollinate, and learn more about the subject from multiple perspectives. This one-time discussion is facilitated by Leonora Zoninsein. Zoninsein is a fluent systems thinker and current Water Fellow at Purpose. adaptation to environmental change in the Brazilian semi-arid region. At Purpose, she is critically engaging with emergent forms of activism, and developing a social business plan for decentralized water services in poor New Delhi neighborhoods. In New York, her participatory action projects are expressed through food-justice themed dinner parties, climate change research poems, guided improvisational movement investigation, and a nascent river basin children’s book series. She looks forward to discussing the complexity of our shared water futures with the Artists in Context, producing new meaning about these issues, and elaborating the iterative practice of artist as anthropologist, urbanist, and activist.